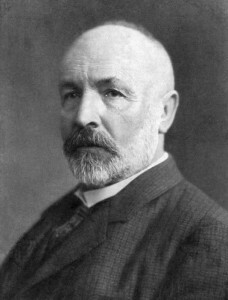 Georg Cantor was a German mathematician who made significant advances in set theory. He was often unpopular with his fellows who objected to the revolutionary nature of his work, but he brushed aside their criticisms. Eventually the correctness of his theories became obvious, and he was a recipient of the prestigious Sylvester Medal. Cantor was born in Saint Petersburg, Russia, on March 3, 1845. Although his mother was a Roman Catholic Russian, he was brought up as a Protestant like his German father. His parents were highly artistic, and the young Georg was inspired to become a virtuoso violinist. Although he was sent to a city primary school, he also benefited from a private tutor. When he was 11, he moved with his family to Germany due to his father’s failing health, a country where he did not feel at home as he had done in his native land. Georg proved an outstanding student, graduating in 1860. By then, he was excelling in trigonometry in particular, and his mathematical brilliance was noticed by his tutors. He enrolled at Zurich Polytechnic to study mathematics, but he was forced to curtail his studies on the death of his father in 1863. A little later, he went to the Universities of Berlin and Gottingen, writing a dissertation on number theory. He was awarded the title of Doctor of Mathematics in 1867. In 1868, Cantor became a member of the Schellbach Seminar, shortly afterward gaining a post at the University of Halle. He continued his work on number theory, but also made further studies into matters focused on trigonometry. In 1870, he solved a long-standing problem concerning trigonometric series, startling his seniors. By 1873, Cantor’s discoveries were at their height, and in that year he both proved the ability to count rational numbers and proved that every interval in a sequence contains infinitely many transcendental numbers. He was by now Extraordinary Professor, attaining the full rank in 1879. Cantor was happy with the work he had done, but desired a position at a university of higher status. In 1882, his correspondence with Gosta Mittag-Leffler led to a number of breakthroughs in the study of set theory, including (the following year) the first use of the word “countable” in this context. It was also around this time when he published a series of six articles in a German mathematical journal expanding on his ideas. His contemporary and rival, Kronecker, was merely the most vocal of many who profoundly disagreed with Cantor’s thoughts, believing that a finite number of steps should be sufficient to create mathematical concepts from natural numbers. Cantor was badly affected by Kronecker’s ridicule and he suffered a breakdown in 1884. This was short-lived, however, and he turned to the study of Elizabethan literature, as well as becoming a philosophy lecturer. He founded a German mathematical institute in 1890, in which year he also made up with Kronecker, although the two never became close friends. He spent his free time with his wife and six children, as well as playing the violin. After receiving the Sylvester Medal just before World War One, Cantor retired. His mental problems were again affecting him, and he spent his final years in a sanatorium. He died on January 6, 1918.